Kindergartens in Denmark look nothing like they do in Australia. 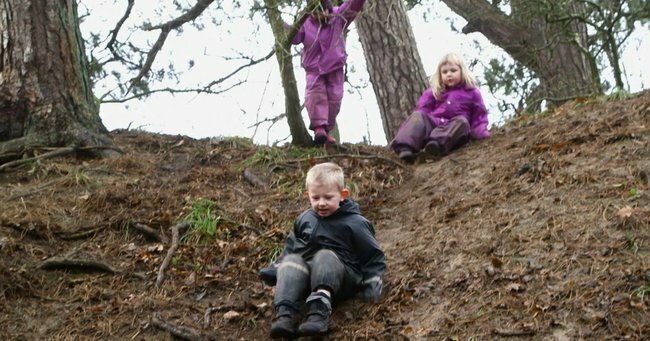 Knives, open fires and tree climbing: Could this be what Aussie kids need? I first came to Denmark 23 years ago with a group of students training to work in the early year’s sector. We’d heard so much about Danish kindergartens and wanted to see for ourselves what was so special about it. The first kindergarten I visited was a nature kindergarten on the outskirts of a town. Nothing seemed so different inside the building – apart from the fact that no one was there! Venturing out into the woodland beside the kindergarten I discovered the children and pedagogues (the early year’s educators). Children were climbing trees, playing out of sight of the pedagogues and whittling sticks with sharp knives beside an open fire – I was shocked and terrified, but also fascinated. The children seemed so competent, happy and at ease and the pedagogues looked relaxed – how could that be? Weren’t they worried that the children would come to harm? Looking closer and talking to the pedagogues, I realised that the children were skillful in what they were doing, the pedagogues trusted them and treated them as competent and there was a feeling of co-operation and teamwork across the ages. Children playing in the kindergarden. Image via SBS Dateline. 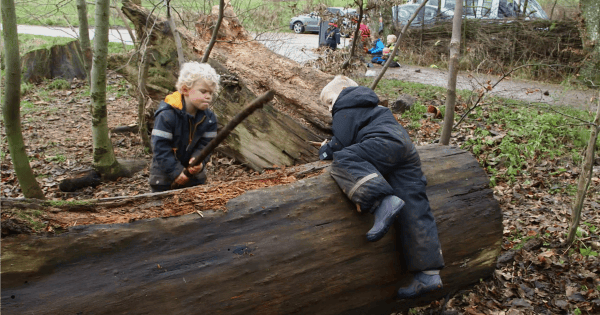 I have now spent 19 years working and living in Denmark and have come to fully understand and appreciate the pedagogy of children learning, developing and just being outdoors. It’s not always easy and the pedagogues and parents need to have a very clear understanding of what is going on and how they can nurture and support the children. Over the past 14 years I have run many residential courses, with participants from many countries, including Australia, Bermuda, China, UK, USA, South America, Canada, Greece… Most have experienced the same as I did all those years ago – a mixture of fear and fascination and many have said that it has been a life changing experience! Of course, what happens here in Denmark can’t be ‘exported’, there are cultural, societal and environmental differences, but there are parts that could work outside Denmark. I have visited kindergartens in Australia and seen fantastic practice taking place in the bush or on the beach – the teachers said that once they’d been here in Denmark on a course, they felt inspired and confident enough to start using the outdoors more back home. Despite government subsidies for winter clothing, it costs Danish parents a lot to keep their kids warm and waterproof. Image via Marianne Borowiec/SBS Dateline. I have had so many emails from previous participants, telling me of their experiences using nature with children. One participant from the USA said, ‘I just had the best day playing the kids in the rain. This is such a revolutionary concept for my school. I just wanted to say thank you again for everything I leaned from you in Denmark’. I don’t count myself as an ‘expert’ – I’m still learning! But I am so happy that I can in some way facilitate people’s self-confidence to get outside with children – no matter what their outdoor environment is. 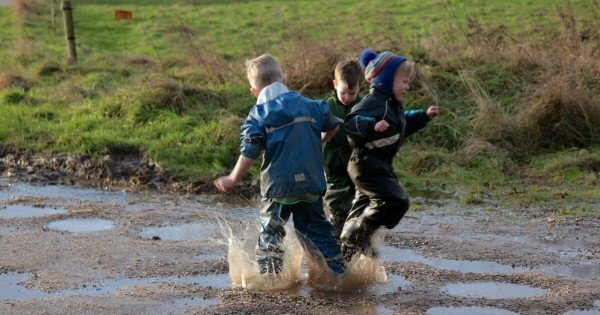 Research is showing the huge benefits of children spending time outdoors – better brain development, better bone and muscular development, better social and cognitive development, emotional wellbeing and less illness. You’d think this would convince even the worst couch potato, but unfortunately not so. Just in the last week I’ve read reports with very worrying findings. The first, from the British Heart Foundation, says that 91% of children aged two to four years do not meet the Chief Medical Officer’s physical activity guidelines of three hours a day. The second from Natural England, states that one in nine British children have not visited a park, forest or any green space in the last year. One commentator even said, ‘why waste time walking when you can be surfing’!!!!!! On a similar note, when I was giving a course in the UK a couple of years ago, a participant (who was an early years teacher) came up to me and said she’d had to but a pair of gum boots to do the course, I expressed amazement as I thought everyone had gum boots – her response was, ‘I have a car’! I know there’s some great practice of using the outdoors with children all around the world. Let’s celebrate that, but keep up the fight to have even more. See more on Dateline, tonight 9.30pm on SBS.